Venues fished: so many as I like to flit about but first to mind would be Frimley, Silvermere, Papercourt, twynhersh and park lakes. Top carp fishing tip: Never rest on your laurels, always give as much effort and thought as you can towards your fishing. Highlight of angling career: My fishing isn’t a career. 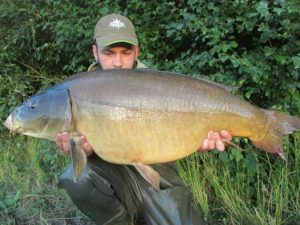 However, my most most memorable catch would have to be, catching the brute from Papercourt after a slow weeks fishing. Once a year I treat myself to a full weeks fishing and that particular week was emotional. National records: Jaffa cakes eaten in one session! Other types of fishing: Dabble fishing for most fresh water fish when time is limited .